Now, can anyone solve the mystery of the technique? I tried to copy his method,but messed up everytime. it does look like bullion. maybe it's a spin off from mary corbett's technique?? with which btw i was able to make them.no luck before. I think that it is different from the bullion stitch that we are familiar with. It will be fun to have a play and see if we can replicate the stitch. Thanks for pointing us to the video. I like your very rich site. thanks for the video. 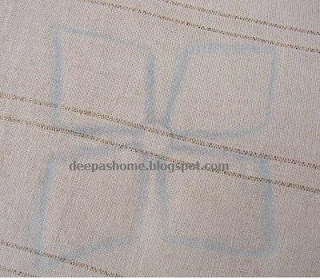 The world of embroideries is without limit!!! Thank you Deepa for sharing this! Deepa ,this is bullion only...i've seen men working in aari style doing this...similarly they do french knot using one hand..as the style requires they retain their left hand always below the aari table/cot..
:0 I dint get the techinique! the natural way of doiing bullion is also a struggle for me! Thanks for clarifying,Poornima,Jisha and Veena. The bullion part is actually clear,but what Iam confused about is the steps before and after - he seems to be doing something totally different before creating the bullion and after.Any idea? Whatever stitch it is ,it is amazing to watch him do it with so much ease.Lovely video.Thanks for sharing it Deepa. Is it possible to contact Javsrock52 and ask him how he does the stitch? deepa, I have answerd on my blog about your question. I hope for you a happy and creative week-end . Amazing video, Deepa, I am in admiration of this stitch.